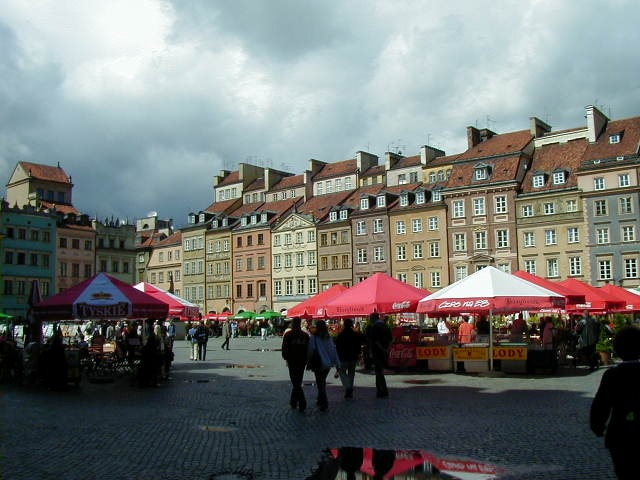 I did my first stay-at-home lodging in Warsaw--I rented a spare room from two little old ladies with a large apartment suite near the train station. It cost 130 Zt a night, about $30. I couldn't do any better near the center of the city. I arrived on Friday and left by bus for Lithuania on Sunday evening. Much of the city was flattened during World War II. It is estimated that 85% of Warsaw's buildings and 700,000 residents, about half the pre-war population, died during the war. Hollywood war movies give a misleading western oriented impression of the war; most of the fighting in Europe was east of Germany and the countries that suffered the most were those between Germany and the Soviet Union. In Warsaw some historic buildings and districts have been restored to near there pre-war condition, but most of the city was rebuilt in modern Soviet architecture. In other words it's bland, ugly and crumbling. I'll show some generosity towards the Soviet Union; when they took over central/eastern Europe* many of it's cities were reduced to rubble and millions of people, perhaps tens of millions, were homeless. There was a desperate need for lots of homes fast, and the quickest way to do this was to use a basic apartment design to build the same apartments over and over and over again. The results weren't pretty but they did the job. Unfortunately many of those buildings which were built at the same time are now falling apart at time, so the countries in Europe which were under Soviet control now need another building frenzy. *On a less generous note, the Soviet Union wasn't asked to take over central and eastern Europe, but nobody in the west tried very hard to stop them. The post-war regions of influence of Europe were decided in the Churchill/Roosevelt/Stalin conferences held before the end of the war. Also, the Soviet Union might have faced less of a rebuilding problem in Warsaw if, when the German military was in retreat, the Soviet forces had not stopped their advance towards Germany at the edge of Warsaw. From there they waited months while the Germans suppressed the Warsaw Uprising and then razed the city to the ground before resuming their retreat. The most photogenic part of Warsaw is the rebuilt Stare Miasto (Old Town), amazingly reconstructed using every "architecturally significant fragment" that could be salvaged from the rubble. The round building is the Barbican, built on a bridge across the moat to reinforce the cities defenses. 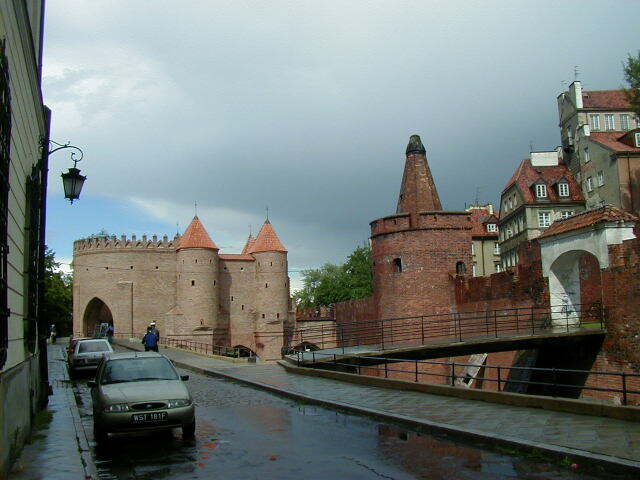 While I was walking around the Old Town I got caught is a brief but fierce rain. The brim of my rain hat was beaten down and my jacket got soaked, demonstrating the difference between water resistant and waterproof. While I was drip drying from the experience a reporter and camera crew from a local TV station gave me an on the street interview about how I felt about tourism in Warsaw. I gave answers that were positive but not profound or witty. Afterwards I realized how ridiculous I looked with wet clothes clinging to me and my rain hat drooping over my face. I may have appeared this way on Polish TV. I hope not. 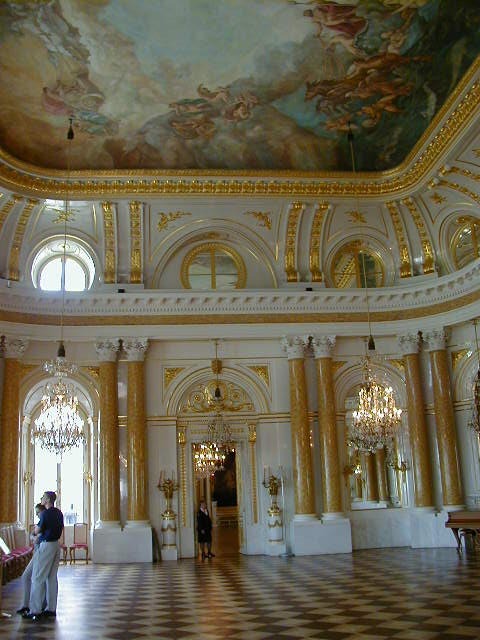 Warsaw also has more palaces than I cared to count, but the only one I visited was the Royal Castle. 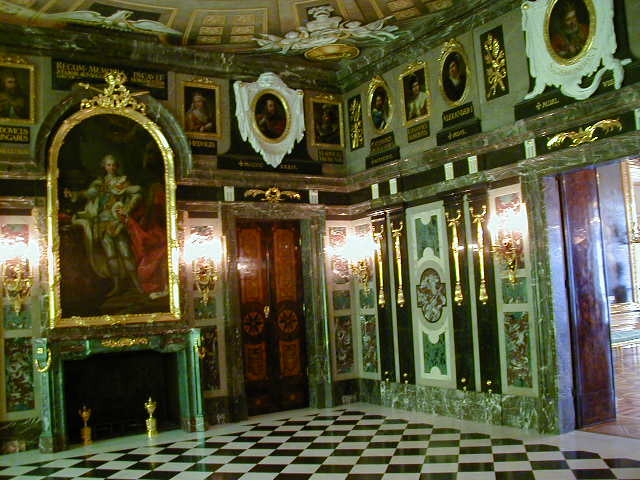 It is well restored, but kind of empty. 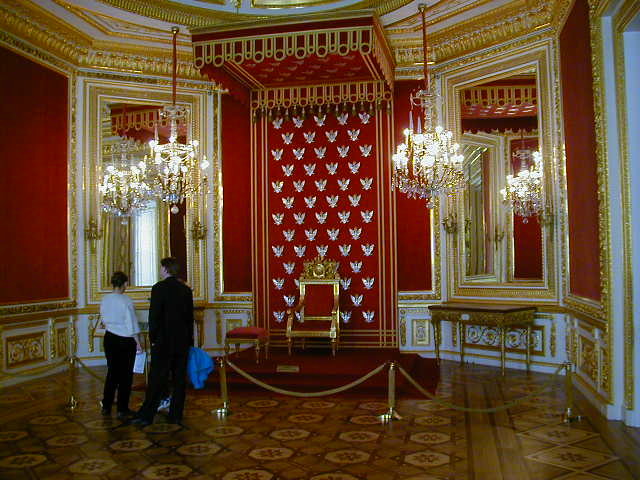 Most furnishings were looted and it will take a long time to fill the castle with appropriate period pieces. 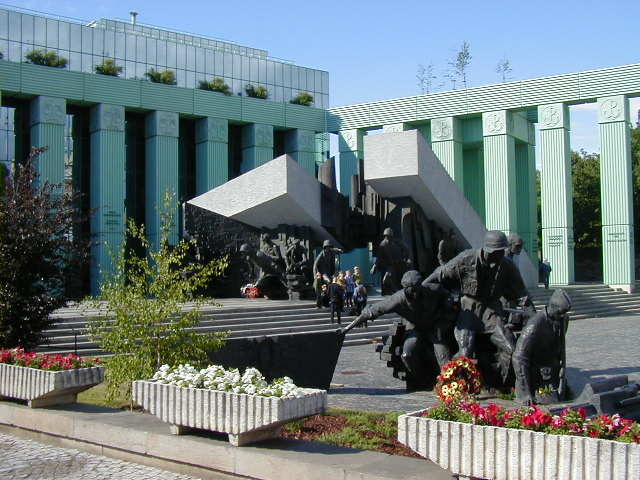 Finally there is the Monument to the Warsaw Uprising, which didn't go up until 1989, when Poland was breaking free of Soviet dominance. I don't know if it was the retreating old guard or emerging new guard that put up the monument. In Warsaw I booked one of the miserable overnight buses to Vilnius Lithuania. I didn't want to, but it was the simplest way to avoid Belarus and their transit visa requirements. 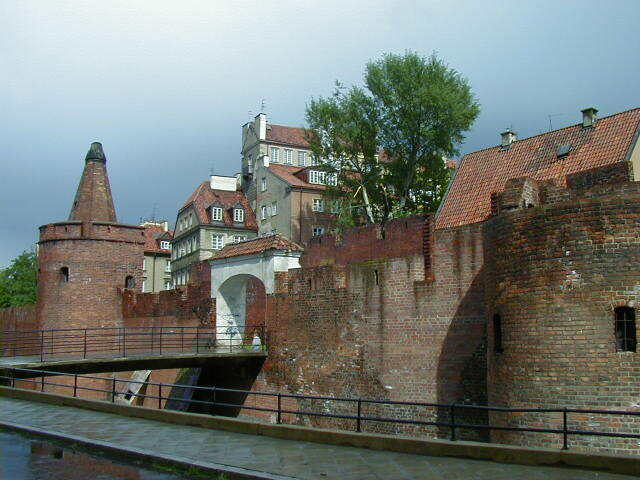 However, if you want to continue the Poland cities, after the Baltic countries I went to Krakow.